Addedum on Kindle Fire graphics speed added November 19th, 2011. 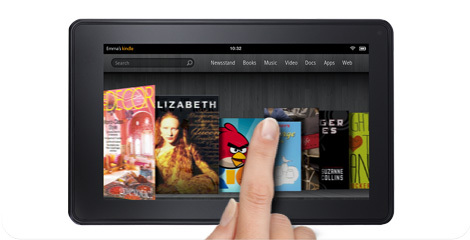 After a day of reflection, I think I understand the genius of the Amazon Kindle Fire. It fills a void that Apple has ignored -- so far. Take a look at this table comparing the lowest priced iPad and iPod Touch to the Kindle Fire and then I'll explain further. Amazon is betting there is a latent demand for a smaller, cheaper pad with a few less features and smaller storage. Though the cheapest iPad has a bigger screen, dual cameras, more storage, more available apps, it costs more than twice as much as the Kindle Fire. The cheapest iPod Touch costs about the same as the Fire but the screen is one-fourth the size. The iPhone 4 really isn't a good comparison. Though you can get one for $199 with contract, that contract costs $1320 for the 24 months of minimum voice and data plans. So has Apple missed an opportunity by not offering a "de-featured" iPad for $199? Do they have a blind spot in their marketing plan? Or have they concluded that it's not necessary or profitable? If the Amazon Kolor Kindle does "catch fire," Apple's "alarms" may go off. They could quickly respond with a $199 iPad and call it "Fire Extinguisher." Anandtech GLBenchmark graph shows iPad 2 and iPhone 4S 'smoking" the Droid Razr and Galaxy Nexus smart phones -- which use the same GPU (PowerVR SGX540) as the Kindle Fire. Ergo, the iPad 2 will 'smoke' the Kindle Fire when doing graphics intensive functions. Apple did decide to make smaller, lower priced iPad mini. It's currently selling more units than the regular Retina iPad. We just wish it had a Retina screen. Maybe in 2013 that will happen. To be notified when new articles are posted, subscribe to our RSS feed or follow us on Twitter@barefeats. If you have a question or comment, .